I was taking a bus to Kudat last week. It was a 3 hour trip. A pretty girl, sitting next to me, fell in sleep and leaned on my shoulder for hour. She gave me a sweet smile when she got down the bus. I saw she was heading to the Kudat / Banggi Ferry Terminal, so I was curious if there were more pretty girls like her on Banggi Island. Banggi Island (Pulau Banggi) is the biggest island of Sabah. Before I went there, I only knew this island was a BIG dot on the Sabah map. That’s all. I never heard anything about it. 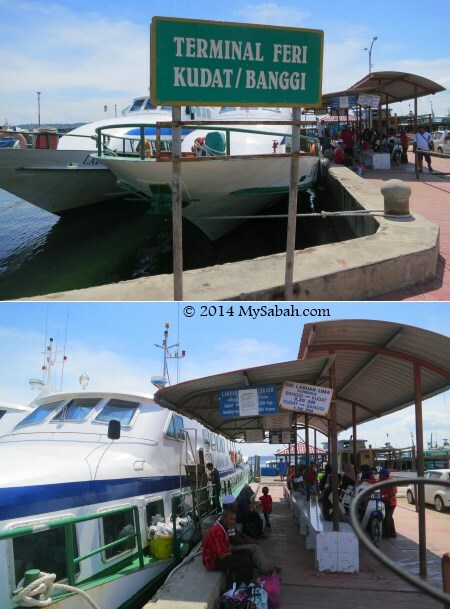 To go to Banggi Island, you can take a ferry at the jetty of Kudat town (see schedule below). There are a few companies offers ferry transfer back and forth Kudat and Banggi. You better wait there earlier than departure time b’coz they may move a few minutes sooner. There were a lot of 3-feet jelly fishes swam in the sea next to the terminal. I heard that a blogger fell (with his camera) into this sea before. Scary… they look very poisonous. The ferry took one hour to reach Banggi Island. I was standing on the jetty and looked around. Hmmm… this island does not look anything like a tourist site. It is just an island, with some villages and building. The locals also looked at me, with the phrase “what is he doing here?” written on their faces. My 016 mobile line got no signal here. The fried banana is quite cheap though. Only RM1 (USD0.25) for 12 pieces, eat until I puke. The locals said I could rent a car to explore the island, and tourists usually went to this island for fishing. You can hire a boat to explore other islands nearby too. I only stayed there for half a day so I didn’t have time to do these. The local also told me there was a Bonggi Resort on the island. If you don’t know the way, it will be hard to find coz the resort looks more like a house. I post the guide below FYI. 1. Turn right after you leave the jetty. Take the way next to the mosque. 2. Walk til the end, you will see two wooden shoplots. 3. Walk between the shoplots til the end, you will see a school. 4. 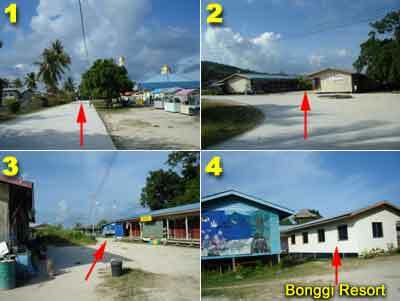 The Bonggi Resort is a white building behind the school. 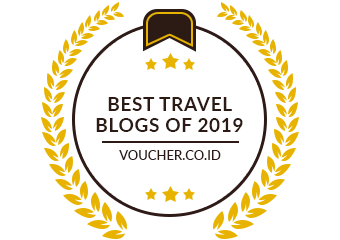 To overnight, you have two choices in Bonggi Resort: (1) Take the fan / air-cond room for RM30 / RM45 per night, or (2) Try the wooden hut (Banggi people style) for RM25 per night. Option (1) got bed, attached washroom, cabinet. Option (2) got light and a bed only, washroom is outside. I was not comfortable with the wooden hut coz it got too many “holes”, very little privacy. Just check out the photo gallery to look at both options more closely. But the most interesting thing is the “tree house” I found outside my room. It is built on top of the tree, and tourists like to take a nap or reading book there. I went back to my room and tried to turned on the light. No power. They told me that the resort only got power from 6 PM to 6 AM (huh!~). The room was so warm in the afternoon, so I climbed onto the tree house and slept until 6 PM, at least I could feel the sea breeze on top. I was a Sabahans lived on tree, haha. I didn’t find that pretty girl eventually, but I took a few photos of the island. Now you can see the photos of Sabah’s biggest island.